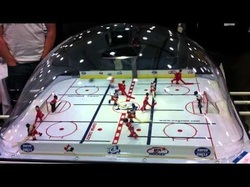 The game of bubble hockey is also sometimes called dome, rod, stick or table hockey. It closely mirrors the sport of foosball in that it has rods you slide in and out of the table to move your players to play the game. Unlike foosball that has multiple men on each rod, bubble hockey rods controls a single man. You slide each bar from outside the table to move the player up and down the rink and twist it to make contact with the puck in order to move it around. Dome hockey closely resembles an ice hockey rink with its oval shape and walls that keep the puck in play and form the bubble. There are a total of six players for each team on the table with 3 offensive rods, 2 defensive rods and 1 goalie rod on each side of the table. It can be played as a 1 on 1 match up or in teams of 2 players each. When played with teams of 2, typically players choose the left or right side and one takes control of 2 offensive players and 1 defensive while the other is in charge of 1 offensive, 1 defensive and the goalie. Anyone that understands the basics about regular ice hockey or foosball will easily pick up the game of rod hockey. The game starts with a face off at center ice when a puck drops in the middle of the table. The object of the game is to use the rods to slide and turn the players to strike the puck with their hockey sticks. Most tables are made with a timer that provides 3 periods to score. A game cannot result in a tie at the end of the 3 periods if the score is even.